Earn a Degree While You Travel! File your homework assignments at wi-fi hot spots. Your classroom can be anywhere you want it to be. Feel the burning urge to get away? Away from your parents? Away from school? Away from responsibility? You're not the only one. More and more young people are choosing the road less traveled and carving out their own path. So check this out. 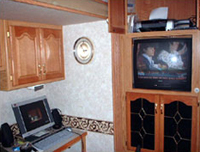 You can get yourself an RV, see the country, and still go to college. As long as you've got a wireless laptop you can take college courses online. You can be out on the road and still get the education you'll need for when you finally feel like settling down. And you'll have way better stories than your peers whose greatest adventure was that one frat party. Online degrees aren't just for the young, either. 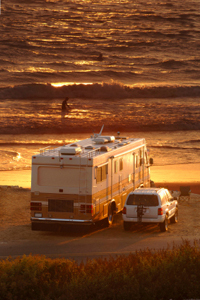 Baby boomers set the standard for adventure and individuality several decades ago. Now that they're finally free of the rat race, they've got a new chance to discover themselves. Are you a boomer? Why not set yourself free on the road, and free your mind with that degree in psychology or philosophy that was just too impractical for your parents to support back when you went to college the first time? The best thing about a road trip dream is that it's not just pie in the sky. Modern technology has made both education and travel more flexible and affordable than ever before. 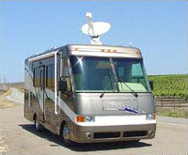 Many campgrounds these days offer wireless Internet access. Many wireless connections are even free. A growing number of cities are setting up "blanket wireless," public libraries are an option, and then there are all those coffee shops where you can enjoy the ambience and the connection. When you get to the point of deciding what courses to take or degree to pursue, ask yourself what you are passionate about and what interests you. If you're still at a point in life where you need to get established, it's worth figuring out what professions or career opportunities will pay and what certification you may need. Research is the key here, and online is the place to look. Business - A degree in business is practical and applicable to nearly every field. This category includes everything from accounting to entrepreneurship. Criminal Justice - This field is your ticket to an exciting and fascinating career studying human nature and promoting safety and law. Design - These degrees will allow you to actually make money with your passion for art. These degrees will sharpen your skills and broaden the media with which you can work. Engineering - These degrees are for those who want to challenge themselves with difficult puzzles. Engineering graduates are also eminently hirable. Healthcare - Healthcare is one of the fastest growing occupations in the US, and it's a great field for anyone with a strong caretaking streak. IT & Computer Science - In some ways, this is the perfect field to study online. The schools listed here offer many certifications that can lead to a good career, and that may not take a full four years to obtain. Psychology - Learn what makes people tick. Religious Studies - Explore your faith and that of others. Vocational Programs - This category is for those who want to get straight to the point. It's something of a catchall category, so see if anything catches your eye. Best of luck with your adventurous on-the-road education! Breanna Hite is a former editor at Guide To Online Schools.